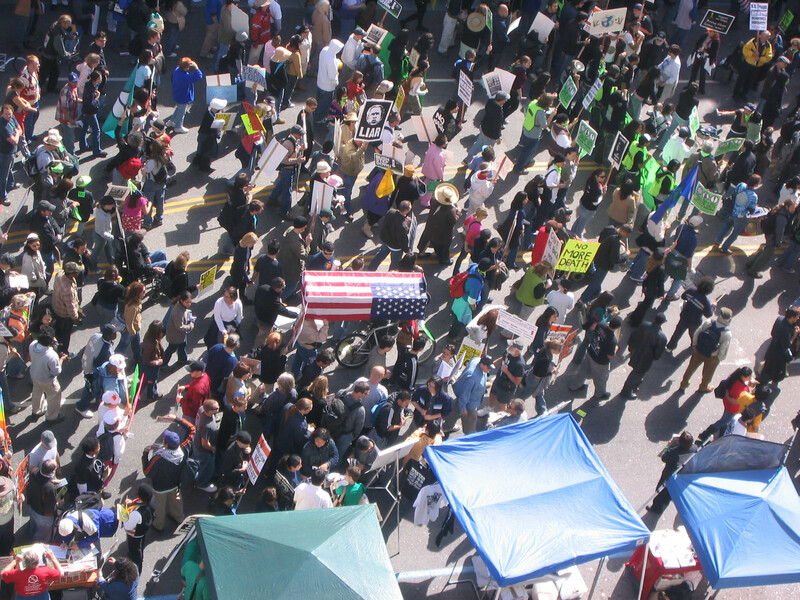 I marched in the Los Angeles protest on Saturday to mark the 3rd anniversary of the Iraq invasion by U.S. led troops. The turnout was once again great, I would say around 5,000-7,000 people came to represent. You can see my pictures here. This march was another sign of hope that we are not alone and in fact huge numbers of us want peace and justice. Los Angeles is such a huge, disconnected place with no open spaces and to see such a huge group gather like this for the 3rd time in a year is very promising. I just added this song called “Message For Freedom” by Sarah Thompson to our protest songs page. You can listen to it from a segment on DemocracyNow! Watch it here or you can download it here. This is licensed under Creative Commons, so don’t worry, it is legal to download! This song is very moving. MoveOn has started a petition to be sent to your local Senator to stand up with Senator Feingold to censure Bush. The Bush administration is using fear to get Americans to allow themselves to be illegally monitored. Information came out this morning, as reported here on Democracy Now!, that at least one pacifist group has been monitored. I believe the Bush administration is using this power to eliminate dissent, and so I signed the petition. Go to this site to sign up: political.moveon.org/censure/. Debt vs. Social Security: Which is in Danger? You decide—Which Fund Has the Crisis!? This clock is from a cool site called zFacts.com. According to the about page, the site is done by a PhD in Economics who asks good questions and tries to look only at the facts. What a novel idea!!! This clock I think tells a lot. I thought about just displaying the debt clock, but I think comparing it to the social security clock puts the social security issue in greater context.